This is a little card that I have really enjoyed making and it will suit a lot of my family and friends when their birthdays come around. I know that you can buy this sort of shape but if you have these dies in your collection already then why not make them work for you ... rather than buy more. This has the combination of the Heart shape and an Oval but when used together the effect is really lovely. 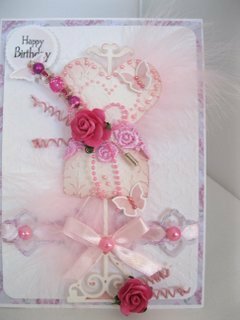 The addition of the feathers, flowers and lace makes it look very special and I am sure that you won't be disappointed with what you come up with. The flower in the video is created from the Ribbon Flower tutorial and has a pearly Brad added to the centre. 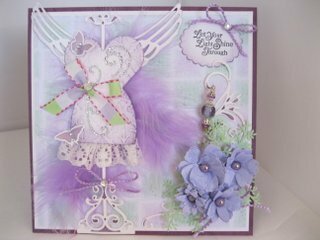 The Gemstone Flourish is from Want2Scrap and adds a very elegant feel to this card. You can add all the frills and frippery to your hearts content on a card like this and it is just the sort of card I enjoy. 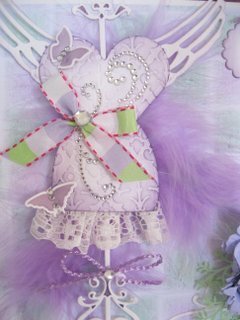 This is a close up of one that has the addition of the wings from the Antiquities set from Spellbinders and again shows how more of the dies can be used in another way. I have also added some lace around the edge of the dress form and some tiny butteflies that are also from Spellbinders. The dress form stand is made fro the Elegant Posts again used in a different way. I will be adding written instructions for this card but for now enjoy the video. And please don't forget to add your cards to the Gallery page for us all to see what you create. I hope you will enjoy this Spellbinders Dress Form Tutorial ... I know that I have enjoyed making all of the cards and the video.